Tip 1: Keep a focused color palette in mind and then shop the house. Determining your color palette is the first step in any decor project. 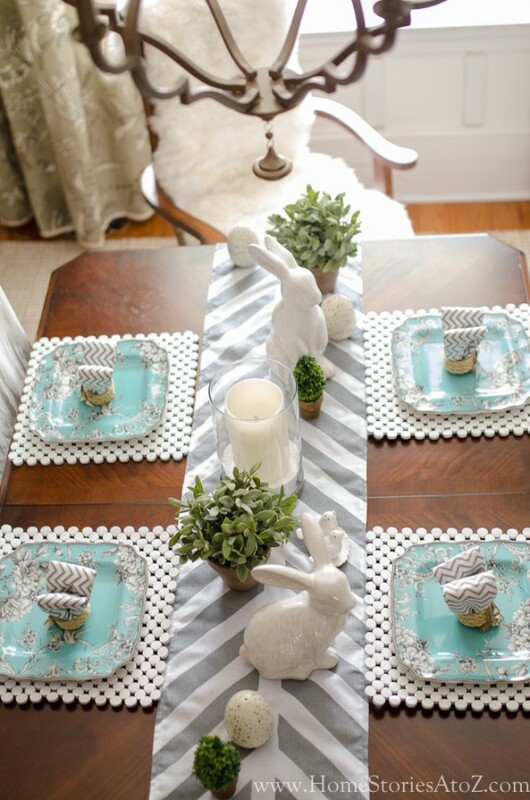 For my table, I chose to go with gray and green with a few pops of blue. Narrowing down your color palette to just a few colors allows you to “shop” your existing dishware and accessories quickly. For those who might be new to the phrase, shopping the house simply means taking inventory of what you already have on hand that might work for your project. When I shop my house, no room is safe! I might grab a topiary from the bedroom, a vase off of a bookshelf, or a plate off the wall. I believe that decorating should be ever-changing and that objects were meant to be moved around and played with! Give yourself the freedom to grab the unexpected from your home, and don’t be scared to try it out to see if it works. With so many spring colors how do you pick just a few? Choosing a color palette that you can easily pull off with what you currently have on hand will save you time and money! If you love violet, but don’t own anything violet, it’s going to make your task a bit more involved. But if you have your heart set on violet, it’s a good idea to use mostly white tableware and shop for just a few pops of color to achieve the look you want. 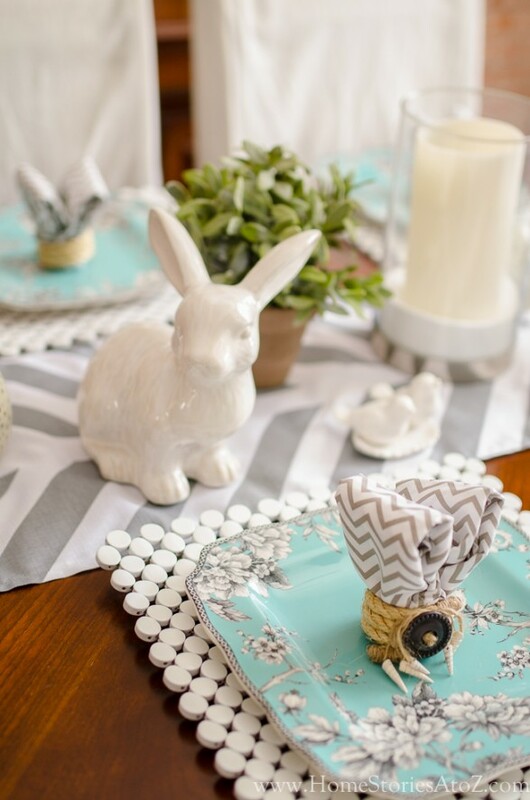 Tip 2: Add a little whimsy to your table. 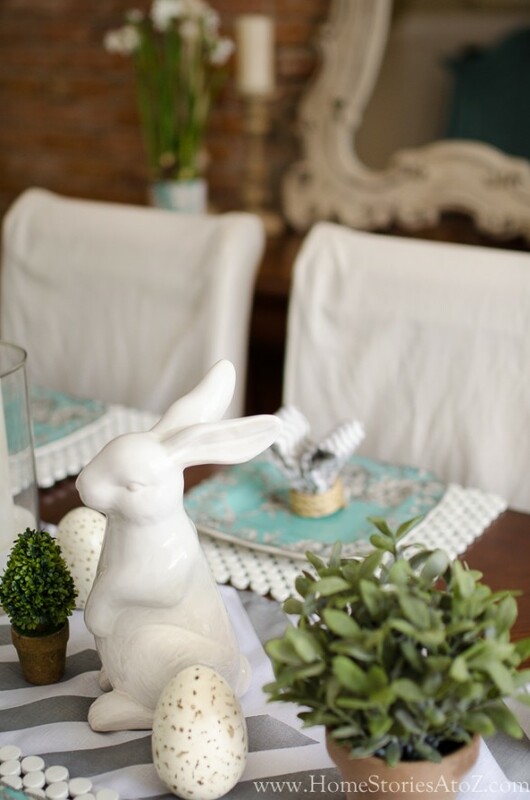 Whether it’s a flower arrangement in a gravy boat, moss and bunnies on a cake-stand, or napkins folded to resemble rabbit ears, your Easter table deserves something a little unexpected. 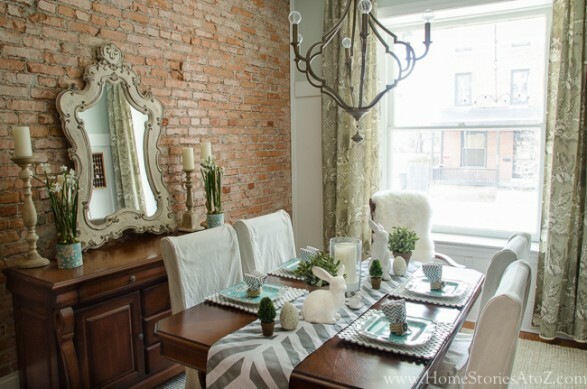 The unexpected in decorating draws you in, makes you smile, and adds personality. 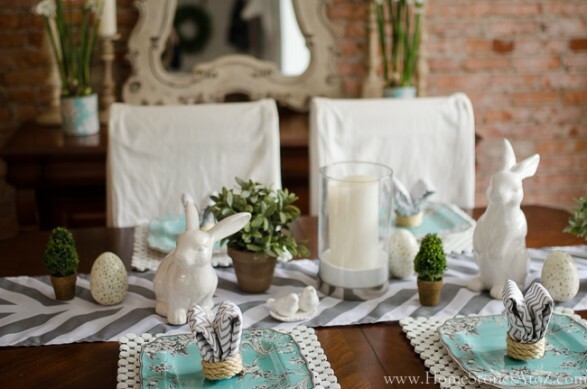 The speckled oversized plastic eggs on my table were from a DIY Easter project I did 5 or 6 years ago. I thought they were a fun addition to the table and can be filled with treats or blessings for my boys. The jute napkin rings were also a blog tutorial from years ago. I folded cloth napkins lengthwise and tucked them into the napkin rings to resemble bunny ears. 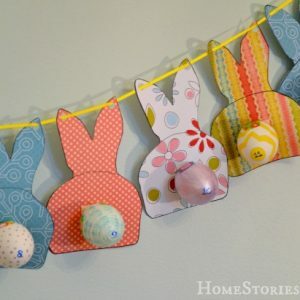 When my boys arrived home from school, they were thrilled to see cute little bunny napkins waiting for them on the table! You can never go wrong with adding a little whimsy! Tip 3: DIY what you can’t buy. Holiday meals can be stressful and expensive. Decorating for them shouldn’t be either. If you are short on cash and don’t mind the time investment, creating some of your own decor is a great way to get the look you want for less. The table runner below is actually a $7 tablecloth, cut to size, taped off, and then spray painted. You can find the complete tutorial for the table runner here. The placemats were originally a dark-stained wood and I spray painted them white to look like white penny-tile. The faux paper-whites on my hutch had birch log vases. I needed another pop of blue for my tablescape, so I temporarily covered the vases with coordinating scrapbook paper and tape. I love to conform what I already own into what I want it to be! And that is all there is to it! 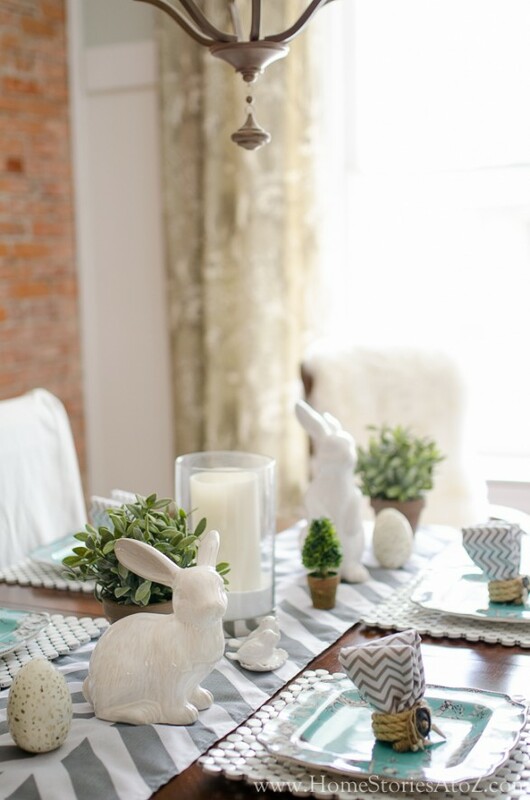 I hope you feel inspired to set a pretty and effortless table this Easter. I’m looking forward to a quiet Easter dinner with my little family of four this year. Now that the table is set it’s time to plan the menu. 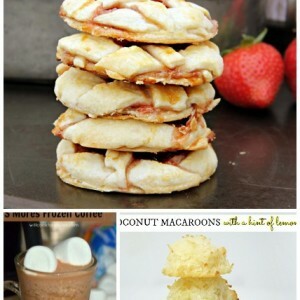 You might enjoy the related links below for menu ideas! Awesome tips! 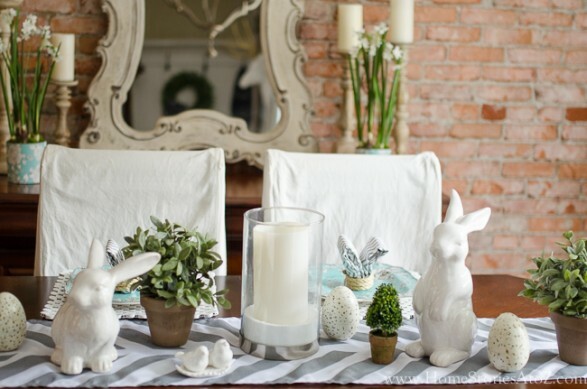 I think a lot of these can apply to tablescapes all year round – not just for Easter. 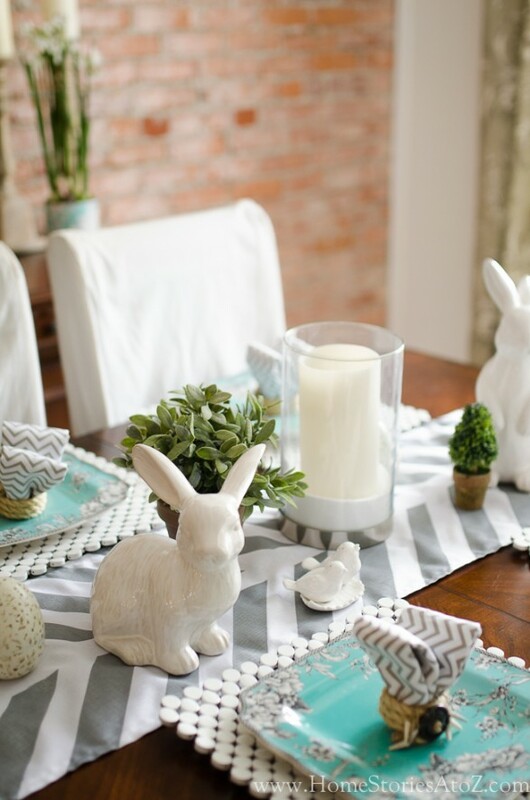 But I do love just how Easter-y you were able to make your table without the typical pastels of Easter! Great job! 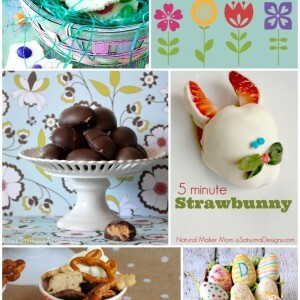 love love love those bunnies! Where do you get them? I love the tip to narrow down colors before shopping your house! That makes it a lot less overwhelming! This tablescape looks gorgeous!!!! In love with those gorgeous plates! I’d be flattered Kimm! I’m not sure if you have a Christmas Tree Shop near you but that is where I found them. They were so cheap too. Thanks for visiting and taking the time to leave me a comment!